Thanks to our grooming experts, early winter snow and operations efforts throughout the winter, we can offer a bonus one-weekend extension to the season! 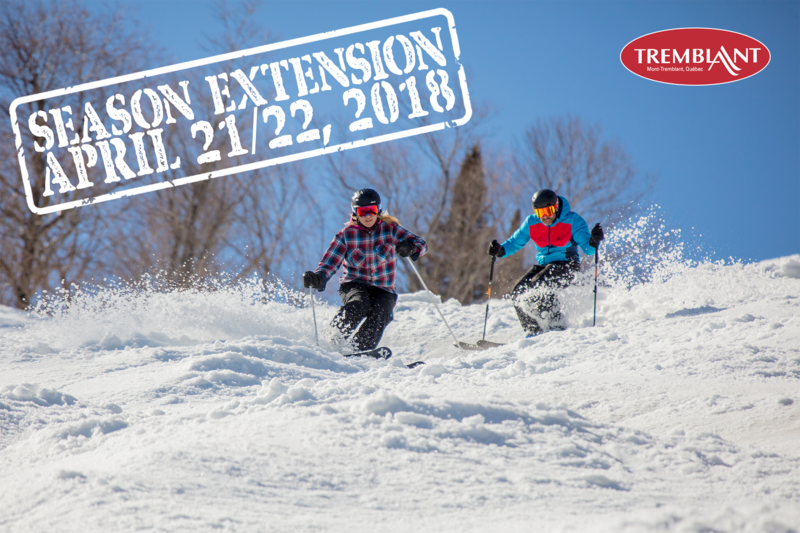 Originally scheduled to close on April 15th, Pass holders of all types of 2017/18 Tremblant pass and authorized tickets (including Unlimited Season, Hookie, Sublime as well as Latitude Cards and other tickets valid for the 2017-18 season) will be enjoying two extra days of spring skiing this April 21 & 22, 2018. The South and North sides of the mountain will be open from 8:30 am to 5 pm both days. The Chalet des Voyageurs Customer Services Desk will be open from 8 a.m. to 4:40 p.m. and the Johannsen ticket office will be open from 8 a.m. to 3:30 p.m. The Centre Aventure Sommet des Neiges, Fairmont Rental Centre, Café Johannsen and Le Ski Shop will be open during the mountain’s operating hours and Valet Ski Services will also be offered. The Snow School, daycare and Aquaclub La Source pool will be closed. The Fourchette du Diable will be closed but restrooms will be accessible. Customer Services and rental counter will be open according to the mountain’s operating hours and the ticket office will remain open from 8 a.m. to 12:30 p.m.
Due to renovation undertaken at Le Grand Manitou, several chairs have already been removed to facilitate operations. All Grand Manitou services will be offered, including the cafeteria and restrooms. Weather permitting, a BBQ will be installed outside on the balcony. In case of colder weather, the grill counter in the cafeteria will be open. Flying Mile, TGV, Duncan and Expo lifts will be operational. Due to maintenance work, the gondola and Cabriolet will not be in operation. The Lowell Thomas chairlift on the North Side will be dismantled during that weekend, as it is being replaced. Since the Cabriolet lift will be closed, shuttle services from the P1 and P2 parking lots will bring guests up to the Sommet des Neiges. To find out more on the number of trails that will be open and the weather forecast, visit the Ski Conditions page on Tremblant.ca. Already thinking of next season? We look forward to seeing you on the slopes for one extra weekend!